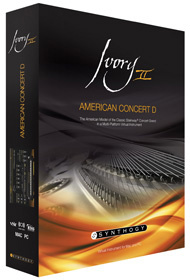 Ivory II - American Concert D, Virtual Acoustic Piano from Synthogy. Synthogy has introduced their newest virtual piano instrument, the Ivory II–American Concert D at the 2012 Winter NAMM Show. Ivory II–American Concert D is a 1951 New York Steinway model D, a free-standing virtual instrument and the 4th product in the Ivory II line. This particular New York Steinway D has the designation "CD 121" signifying that it was selected by Steinway & Sons for artist promotion and concert hall specification. Ivory II–American Concert D will feature up to 20 velocity levels and run as a plug-in or standalone. For existing Ivory II users, Ivory II–American Concert D will install directly into the existing Ivory II library, giving access to all of Ivory II's pianos and features from one interface. MSRP will be $199 when released in 2012. Xhun Audio IronAxe Xhun Audio recently released information, including a Technology Overview, about its upcoming product IronAxe. Mildon Studios Provoc Grader Mildon Studios has released Provoc Grader, a new vocal compressor VST plug-in for Windows. VirSyn iVoxel 2 Virsyn announced the revised Version 2 of iVoxel and the release of Addictive microSynth 1.1 with support for Akai SynthStation 25.